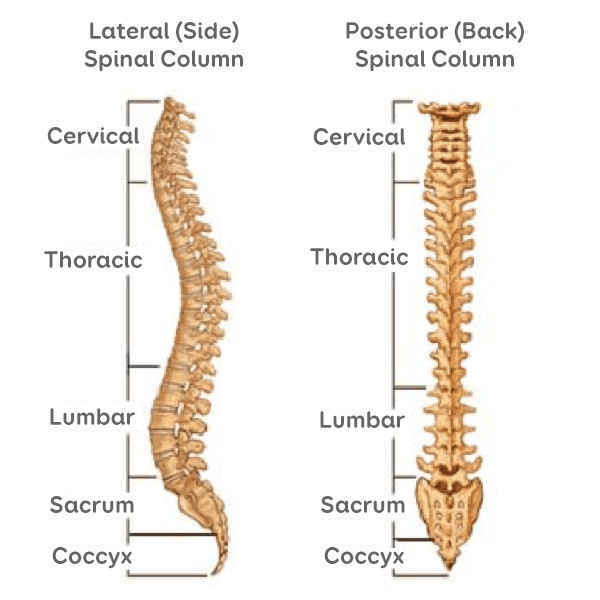 There are 4 different regions to the spine: The cervical or neck, the thoracic or chest spine, the lumbar or lower spine and the sacrum & coccyx. The spine, or backbone, provides the main support to the upper body, allowing you to stand, bend and twist whilst it protects the spinal cord and nerves. The spine, or backbone, provides the main support to the body, allowing you to stand, bend and twist whilst it protects the spinal cord and nerves. It is usually made up of a total of 33 vertebra, which can be split into 4 sections. Starting from the top: Cervical spine - which consists of 7 vertebrae; Thoracic spine - consisting of 12 vertebrae; Lumbar spine - consisting of 5 vertebra; Sacrum & coccyx - 5 fused vertebrae plus the coccyx or tailbone. Very occasionally some people may have fewer or greater then the usual 33. The vertebrae are separated by the inter-vertebral discs and linked to each other by a pair of facet joints at the back of the spine. The facet joints are similar to your finger-knuckle joints, allowing the spine to flex & extend. They are prone to degenerative change (arthritis) in later life which can cause both problems of back pain & sometimes nerve pressure. The discs are like shock absorbing cushions between the vertebra that they are bonded to. They are made up of a nucleus, which is a softer almost spongy centre and a tough, strong outer wall called the annulus. They act as spacers between the bony vertebrae. 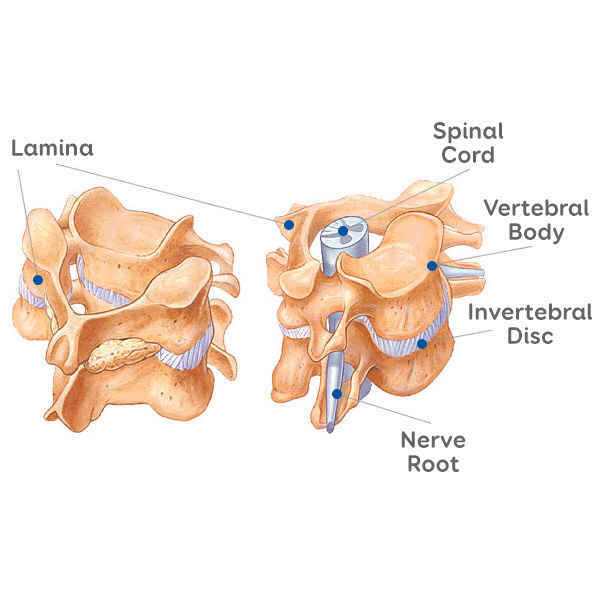 The discs are name depending on which 2 vertebrae they sit between (e.g.. L4/L5). The spinal canal is the bony tube running along the whole length of the spine from the bottom of your skull to the sacrum. In the cervical & thoracic spine it contains the spinal cord surrounded by the CSF or spinal fluid. In the lumbar spine it carries the lumbar & sacral nerves (cauda equina) surrounded by CSF. The ligamentum flavum is an elastic ligament inside the spinal canal which allows the spine to flex. In later life this ligament can sometimes become thickened and push on the spinal cord or nerves. 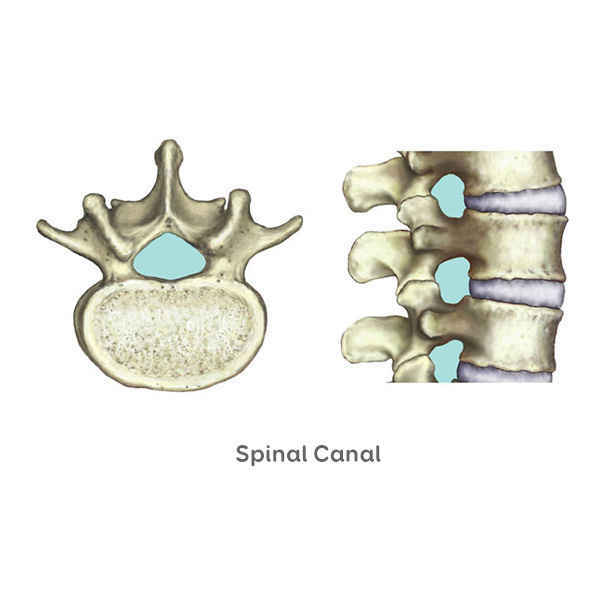 The spinal canal is a bony tunnel formed within the vertebrae. It contains the spinal cord & nerves surrounded & cushioned by the CSF (cerebo-spinal fluid). The spinal cord and nerves float within the canal, cushioned by the CSF. The nerves exit the canal through small holes between the vertebra called foramina. The nerves go on to supply many structures including the muscles, skin, joints as well as internal organs like the bladder. Each spinal nerve root has a very defined distribution. The spinal cord and the nerves lie very close to the discs and facet joints, so spinal conditions which affect these structures such as a disc prolapse or arthritic facet joint can easily create nerve compression. There are 31 pairs of nerves that branch off from the spinal cord. These nerves carry messages back and forth between the body and the spinal cord and brain to control sensation and movement. The front (ventral) part of the nerve root carries motor impulses FROM the brain and the back (dorsal) carries sensory impulses TO the brain. These nerves are numbered according to which vertebral level they exit the spinal canal. Each nerve innervates specific areas across the body which are known as dermatomes. 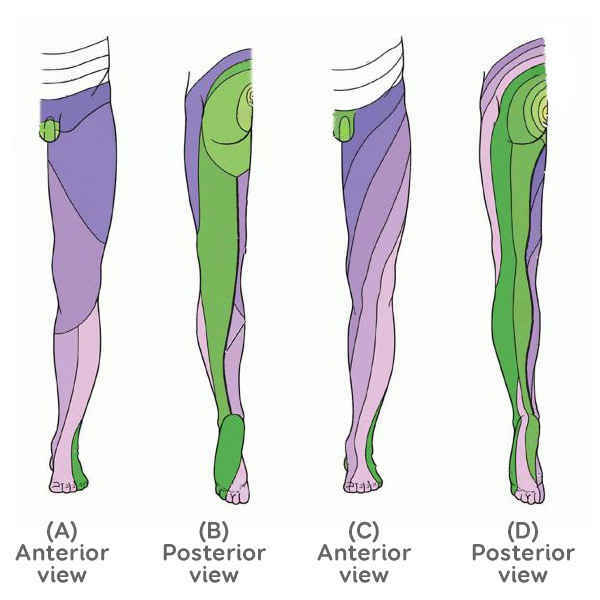 Using this pattern, Mr Cass can often diagnose the location of the problem based on the area of pain, weakness or altered sensation.